Hi, welcome to RapidFireArt! My name is Darlene and in this tutorial I’m going to teach you how to draw a realistic eye using easy step by step instructions. This is my first tutorial, so I hope you enjoy it! UPDATE: For a while now, you guys have requested a tutorial on drawing a pair of eyes. Here it is, along with a super in-depth tutorial as well! Let’s start off with an HB pencil to sketch the shape of the eye. This outline should not be too dark because you want to prevent it from showing through in the end. We just need the basic shapes outlined at this point. The square shape in the pupil is a glare from a window or similar shaped light source. You can use other shapes such as circles or ovals as well. How to draw realistic eyes from SCRATCH! Using a 6B pencil, fill in the pupil. Avoid pressing too hard or else it will be hard for you to erase if you need to make corrections later on. You can go over the area again to achieve a darker shade. Make sure the highlights stay clean! On a separate sheet of paper, smear some graphite into a small area. Use the blender to rub the area until the graphite has transferred to the tip of the blender (learn how to use a blending stump here). You will now use that to fill in the outer area of the pupil. This step does not have to be done perfectly. Sloppy smudging will make it turn out better, as well as give the eye more depth. With a 4B pencil draw spokes going outward from the pupil. Overlap some of the spokes to create thicker lines. This will make the eye look more interesting. Leave some areas untouched as they will be filled in later. If you’re enjoying this article, click here for another realistic eye tutorial! Use the blending stump to fill the white space in the iris. Carefully work around the highlight. Don’t press too hard. You should still be able to see the lines coming out of the pupil when done. If most of the lines have disappeared, you have either used the blender with too much force, or have not pressed hard enough when creating the spokes. Use the 6B pencil to create a shadow under the eye lid to give the eye more depth and roundness. Shade the eye whites as well as the skin around the eyes. Don’t leave the eyeball white or else it will appear unrealistic and lack depth. For a more detailed tutorial on shading eye whites and how to make eyeballs look round, click here. Darken the creases using a 4B pencil. Use the kneaded eraser to make the highlights pop, as well as dab areas of the eye that need to be lightened. For example the eye whites, lower lash area, brow bone and the inner corner of the eye near the tear duct. Want to improve your shading skills? Click here to read my shading tutorial! Fill in the eyebrows as well as the eyelashes. Eyelashes should be drawn using curved lines, NOT straight lines. To create the eyebrows, use a thin HB pencil. For the eyelashes, go with something darker, like a 6B. Go over the drawing and darken areas such as the pupil, creases, shadows and clean the highlights to make your drawing POP! I’ve added some eyelash reflections, some subtle blood vessels as well as darkened the overall drawing. Try to use as many shades as possible when drawing eyes. Most people are afraid to go dark. Look at the picture in step 8 and compare it to the last step. Going dark makes a huge difference! I used to stop at step 8 too, because I was afraid I wouldn’t be able to erase if my hard work turned into a complete disaster. This fear left me unsatisfied with all my drawings because they lacked depth. So take it a step further and make use of your softer pencils! I hope you enjoyed this simple step by step tutorial on how to draw a realistic eye with pencil.If you have any questions or requests, let me know in the comments below! If you love RapidFireArt tutorials and want to support what I do, check out my Patreon page where you can support RFA and earn cool rewards at the same time! Darlene created RFA In 2013 with the goal of sharing simple yet detailed drawing tutorials with other artists on the world wide web. She is a self taught pencil portrait artist and Youtuber. How to Make Drawings POP! This tutorial was great! I did it… mine looked pretty good, but my eye shape was a little off. Thx! Hey can you do an anime tutorial #ILoveAnimeDrawings!! Thank U! How do you shade and how do you get better at drawing because I am not that good at drawing and i want to get better. One way is to use the side of the lead but you can also lightly smudge it with the tip of your finger. After 40 tears of letting my sketching lay dormant, the reminders help it click again. I liked it and it is a very good Idea that you did this because I was very good at drawing eyes but know since I have not drawn in a long time I can’t really draw them anymore. Equal work is supposed between steps but between step 6 and step 7 a lot of work was done! Not just shading but also more details. I am working back and forth in your tutorials (currently focusing on eyes). I think they are excellent. What I do notice however, is the difference between what is actually in the tutorial(s) and the finished images. That is what I can only describe as the light area of the lower lid. This shows up really clearly especially when you are dealing with shading and with eyelashes. Yet in the actual drawing steps it is never addressed. Are we aiming to create two double bottom lid lines, between which we leave a very lightly shaded area? Are we doing that when we draw the original lower lid–creating a twin but a slight distance below? Like the others I find these tutorials very helpful. Thank you. Hi thank you so much for this tutorial it was very helpful. Do you have any tips on how to make the right eye I just can’t seem to figure it out. amazing tutorial!! I just loved it! It helped me so much to my art project! I almost gave up on that project… but then I found your helpful page!! Thank you so much!!! I’ve been trying to draw eyes for forever just by looking at pictures and I’ve never been able to make them look good but these steps made it so much easier! It turned out better than I could’ve ever expected. This was so great! Thank you! I loved the tutorial, and finally succeeded drawing a beautiful eye. Thanx a lot. PS. I also learned what that white pencil out of paper is good for in my box. :))). I. Love. Your. Art. SO. FLIPPIN’. MUCH!! nedavno sam slučajno naišao na Vašu stranicu i jako mi se sviđa,detaljno ste sve objasnili a sad treba puno truda i vježbanja,puno Vam se zahvaljujem na savjetima. Thank you for the tips! You’re a great drawer, and someday, I hope I’ll be as good as you! ummmm…. hi i like your drawings!! hi i am not a very good drawer but this girl in my class inspired me so i saw this eye you made and it was a amazing drawing you made thanks for all the tips. Love love love all your drawings!!! Goood job!!!!!!!!!! I LOVED the strategy you used for the eyes, the eyelashes and the eyebrows ❤It has really helped me SO MUCH!! Do you think you can send me an email with more strategies? I don’t have any of the fancy HB pencils or stuff like that, could I still draw it? Of course you can :) You can use a regular school pencil (they’re usually HB). The other pencils mentioned will just give you darker values so that the eye will have more depth. If you’re using 1 pencil to draw this, you can apply more pressure to get the same effect (to a certain degree). 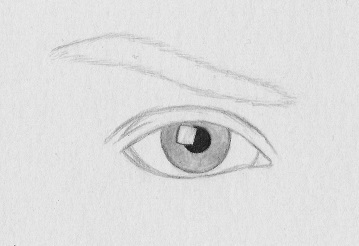 I usually have my own way to draw realistic sort of eyes (not as realistic as yours) but I decided to try a different sketch of eyes (yours) but I only tried doing it in HB pencil. It worked out really well surprisingly. I love your drawing. Thanks Kayla, so happy it worked well for you! I just downloaded your tutorial picture! just started self learning how to draw, I hope you all the best and succeed in your art works! Hello! This is a great tutorial, first off. Your art is beautiful. I was wondering, though, approximately how long does one of these drawings take you? I know they’re all different but, for example, this eye. How longing might just an eye take you to finish on average? Thanks Lain. 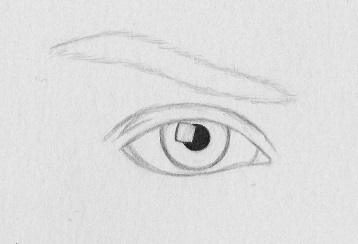 If I remember correctly, this eye took me around a week to draw because I had to plan out the steps very carefully for the tutorial. If I’m not writing a tutorial, a similar drawing could take me around 40 minutes to 1 hour without taking any breaks. Don’t say “never”, Gilbert! It took me roughly 8 years to get to where I am today (longer than most people). I wouldn’t exactly call it talent… It took a lot of time and commitment to develop this skill. Wow.. Amazing.. thank you so much for your tutorial..
You are amazing! 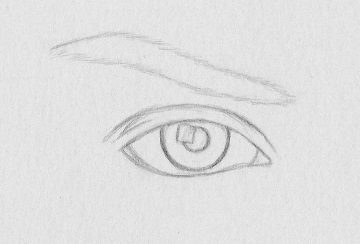 I drew an eye earlier in the day (it was horrible) and then drew this eye and it was instantly better. BY A LOT! How do I know how big or small to make the eye relative to the nose and mouth? Also, where should I draw the eyes, like how close to the nose? And are there any ways to make it easier to draw both eyes symmetrical? As for symmetry, I’m working on another eye tutorial now and will glaze over that topic. If you haven’t already, please subscribe to my email list and I will notify you when the article is up on the site. Hellow I am anuradha.i am trying to draw some poetraits.but i can t draw face correctly(eye lip and eyelash)can you help me. I am unsure if this comment has already been posted, as I recently posted it but it disappeared. But I would like to know how to do Step One. I am VERY stuck on it. Your eye looks flawless but mine looks awful. I know you’re fantastic at this, and I am no true artist, but I still think I can do slightly better. Any pointers? I am stuck on Step One, could you give me some pointers? I am having difficulties shaping the eye correctly, while yours looks flawless. I also do not have an HB mechanical pencil. Is a regular HB sketching pencil okay? Just kidding..it’s my way of saying that you’re freaking awesome. Do you have any tutorials on how to draw the nose? I have a question. Are you related to Oanh Nguyen? Fantastic !!! I like your tutorial so much, it’s really helpful. May I request draw face and eyes from 3/4 view ? Thanks for your suggestions Joel. You can find my 3/4 face tutorial in the exclusive content section. I’ll add 3/4 eyes to my to-do list! Thanks for the tutorials!! Do you have one for shading the face? can u give me tips on drawings lashes and eyes, i dont know how to make the eyeball part look real! I really love your work. I love drawing faces and have issues making them look real. These are excellent tips. Thank you for sharing with us. It’s my pleasure. Thank you for dropping by Renee. wow! it looks almost real!!!! How awesome (and inspiring) that you’re SELF TAUGHT!!! I’ve only now at age 40 decided to give drawing a shot (I’ve been a filmmaker for years) and it’s great to see work that I admire from someone else who is self taught. Thanks! Sorry, I don’t draw animals very much. Maybe I will add some animal drawing tutorials in the future. I need some tips on eyelashes, could you please help me out? Your step by step tutorials and tips & tricks make it so simple and easy…i tried to draw realistic eyes so many times before but none was so good as now…i have sent you a drawing.. Your guide make my skill up sensei :) nice Tutorial for me..
For eyebrows I use a thin 0.5mm mechanical pencil with 4B lead. I sketched my first ever eye today. I doesn’t look as good as yours but m super pleased with what I made. Thanks a lot! Also I am gonna use all your tutorials and will definitely keep looking forward for more tips from you. Also I struggled with the eyebrows, they look worse than my eyes. Could you help me with moustaches and beards too? It’s great to hear that you are enjoying the tutorials! I’m in the middle of a move at the moment so no new tutorials yet. Once I get settled into my new place, I’ll be pumping out lots of new content! Thanks for the helpful tutorial! I was wondering if you had any tips on how to make the eyebrows and eyelashes look more realistic. When I tried, they looked too artificial. Any advice? You are welcome, it’s very kind of you! 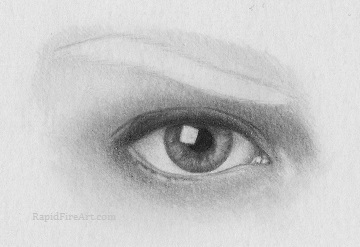 For my personal wishlist (of course if/when possible :) I’m looking forward to a tutorial just about shading, particularly I’d love to “catch” how to exactly move from the picture shown in step 6 (http://rapidfireart.com/wp-content/uploads/2013/05/how-to-draw-eyes-step-6.jpg) to the one in step 7 (http://rapidfireart.com/wp-content/uploads/2013/05/how-to-draw-eyes-step-7.jpg). Currently I’m less or more able to replicate the results shown in your wonderful drawings until step 6 included, but, when I try to shade it and move to step 7… unfortunately all the beauty sparkled by your drawing seems vanishing in mine! In my 2 tutorials below I do talk a little bit about shading, if you want to check those out. I suggest you use a slightly blunt pencil instead of mechanical one to shade the eyes. Thank you so much for your kind and detailed explanation! Well done! You are GREAT, thanks again for your excellent tutorials and the whole website! No problem Joe! :) Thanks for your kind words! thank you very much for your tutorial, very useful indeed! I have 2 questions, if you could clarify I’d appreciate it a lot! Maybe is it the square shape or the outer area of the pupil? You mean shading using the blender stump or a finger? Have I to sharpen the kneaded eraser to do this? Thanks in advance for any help about the above and keep up the excellent work! Yes, the highlight is the square shape. You can shade using your pencil or blending stump. Avoid using your fingers. I’ve had a few incidents where I used my fingers to smudge the graphite which resulted in a permanent blemish on the drawing because the paper adsorbed the natural oils from my skin. Made it impossible to erase graphite in that specific area. Creases: eyelid folds and inner corner of the eye above the tear duct. When you’re using a kneaded eraser in tight spaces, you can roll it to a fine tip to dab small portions of graphite away. I hope you have a happy birthday and very merry Christmas! That’s great Penny! Can’t wait to get more drawing updates from you! Hi Darlene, have been busy practicing with all my new supplies and am progressing well. I am trying to attatch a quick sketch of my 9month old grand daughters features that I did from a photo, its not brilliant but much improved. I may have to do it by email as i can’t find how to do it on here. Keep up the good work by the way and thanks for the free tutorials! I’m back and ready to post more tutorials after the long break I took from the site. There is so much emotion and depth in your drawing. I feel those eyes looking straight into my soul. Im blown away… you make it look so easy and then I try it and it looks nowhere near that! I am very new at drawing with this medium and you have taught me so much on this site! I just wanted to leave a comment and say thanks. I still can’t draw eyes as well as you, but I am working on it. I make drawing tutorials that are easy to understand and apply. So whether you're a beginner or seasoned artist, you can still follow along. As a person who struggled all throughout elementary and high school, I like to explore more effective ways of teaching. That's why I strive to create drawing tutorials that work for everyone! http://rapidfireart.com/ is a participant in the Amazon Services LLC Associates Program, an affiliate advertising program designed to provide a means for sites to earn advertising fees by advertising and linking to Amazon.com. All images and content are copyrighted © by Darlene Nguyen. The use of any image or content from this site is prohibited unless prior written permission from the artist is obtained.